Foreign Service Officers are a key source of what policymakers know about the world. In a sense, each diplomat abroad serves as a collector of information reporting back to the embassy, to the relevant offices, bureau, agency or top levels of the State Department. This information is then shared further within the government. During the Rwanda crisis, except for the rapid closure of the U.S. Embassy in Kigali, the system of regional and global information collection reported dutifully in real-time back to policymakers. Embassies, depending on the importance of the mission, are comprised of officers from the Department of State and other U.S. Departments and agencies with essentially two-fold responsibility: representing U.S. interests abroad and reporting back to Washington on events in the 'host country'. Given the minor U.S. stake in Rwanda, U.S. Embassy Kigali in 1993-1994 was a small mission, lacking a separate political officer, its own CIA representative or its own defense attaché. However, due to Rwanda's sizable humanitarian needs, it did have a US Agency for International Development (USAID) representative. Consequently, two people-U.S. Ambassador David Rawson and Deputy Chief of Mission Joyce Leader-were the primary 'eyes and ears' for policymakers on Rwanda. When U.S. officials locked the Embassy and evacuated from Rwanda on April 10th as ordered by Department of State officials, Washington policymakers lost both this ground-level view and the capacity to influence events in Rwanda. U.S. embassies in France, Belgium and Canada provided another important source of information for U.S. policymakers. As former colonial powers in Rwanda and the region, Belgium and France both had their interests in Rwanda. Mindful of these interests, U.S. officials nevertheless made use of information and analysis gained from these longstanding ties. After April 10, information shared by French, Belgian and Canadian sources was especially useful to U.S. officials: although the U.S. Embassy and almost all American citizens had evacuated out of Rwanda, the other Western embassies (France, Belgium, Canada, Germany and the Papal Nuncio) remained open for a period and continued to report back to their capitals. While a longstanding ally of the U.S., France was also Rwanda's patron, it trained Rwanda's military, and French President Francois Mitterand and President Habyarimana had maintained close ties. Consequently, French views on Rwanda figured significantly to U.S. policymakers, beginning with the U.S.'s initial involvement as facilitator of June 1992 peace talks between the Rwandan government and the RPF. This partially censored May 11 telegram provides U.S. Embassy Paris' perspective on France's role in the crisis, noting "French objectives in Rwanda are, in fact, close to ours", particularly the call for a ceasefire. "In the absence of a media campaign or parliamentary prodding", the Embassy argues, "there is little pressure on the GOF to act". Document 8 Paris 13062, 11 May 94 That dynamic would change shortly, and France would launch its controversial Operation Turquoise intervention into Rwanda on June 22. Given their unique vantage point and the locus of the international response at the UN, the U.S. Mission to the United Nations in New York played a crucial role in U.S. policy, both as information source and policy implementer, and was significantly more engaged on Rwanda than other parts of the U.S. government. USUN gathered information from the Rwandan government, which the General Assembly had elected to the Security Council for the 1994-95 term; from RPF representatives; from the UN Secretariat, including Secretary General Boutros Boutros-Ghali, his advisors and the Department of Peacekeeping Operations (DPKO), headed by then-Under Secretary General Kofi Annan; from representatives of France, Belgium, Canada and other states with interests in Rwanda; and from New York-based non-governmental organizations (NGOs) and private voluntary organizations (PVOs) with associates active in Rwanda. For example, in preparation for April 20th 'informal' Security Council discussions on Rwanda, USUN political officers drew on information from the UN Secretariat about the Secretary General's upcoming report on Rwanda and the status of UNAMIR forces. According to an April 20th briefing memo, they also heard from a Nigerian representative who, referring to the UN response on Bosnia, declared that "Nigeria could not understand how the West could contemplate reinforcing UNPROFOR and withdrawing UNAMIR at the same time." Document 11 USUN Memo, 20 Apr 94 This April 28th memo provides background for U.S. ambassador Madeleine Albright in her meeting with RPF representative Claude Dusaidi. Written just one week after the U.S. voted to cut UN forces in Rwanda, USUN officials acknowledge "the vast majority of the civilians who have been slaughtered in Rwanda are Tutsis" and acknowledge the RPF has "not been responsible for the atrocities." Document 12 USUN memo, 28 Apr 94 Ambassador Albright also met with UN Secretary General Boutros Boutros-Ghali on the issue. On May 4, Boutros-Ghali told Ambassador Albright "forces for Rwanda would be available" if the U.S. could make a "substantial contribution" to a special peacekeeping fund for Rwanda; Albright deferred to await instructions from Washington. That same day, the Secretary General's military advisor Gen. Baril "requested planning information relating to potential U.S. assistance for a UN operation in Rwanda" according to a USUN cable to Washington. Document 13 USUN 01898, 5 May 94 USUN officials ensured that such cables were distributed to offices concerned with Africa and peacekeeping at the State Department, National Security Council, Joint Staff and Department of Defense. The Department of State is charged with developing, directing and executing the foreign policy of the United States. Due to these responsibilities, State had more information and more experts at hand than any other government entity. Consequently, Department officials played important roles in the U.S. response on Rwanda. First, the State Department is the hub to which overseas diplomatic missions report. Second, it maintains country desks (e.g., Rwanda and Burundi) and regional (e.g., Africa) and functional (e.g., Human Rights, Intelligence and Research, or Politico-Military Affairs) bureaus that were engaged on Rwanda. Third, it hosts visitors from other countries. Fourth, Department officials travel abroad to meet counterparts, take part in negotiations and attend conferences, among other activities. Finally, in Washington, D.C., itself, these officials interact with their Departmental and agency counterparts, Congressional representatives and staff, foreign embassy officials, and representatives from Washington-based political groups, lobbies, non-governmental organizations and news media. In short, during the Rwanda crisis the State Department absorbed information and intelligence inputs from all manner of official and non-official sources. Visits by foreign officials are often useful opportunities to gain information on a country or a particular issue, to pressure these officials on bilateral and multilateral issues of concern to the U.S., and to foster relations more generally. In early October 1993, on the heels of the UN Security Council's authorization of UNAMIR, President Habyarimana visited Washington, D.C. and, despite the political firestorm in Washington over the recent debacle in Somalia, was able to obtain meetings with senior U.S. officials, including Secretary Christopher, Under Secretary of Defense Wisner, Acting USAID Administrator Jim Michel and Assistant Secretary Moose. In their meeting, Secretary Christopher "congratulated Rwandan President Juvenal Habyarimana for reaching a peace accord", remarking the president "had shown great courage in making peace with the rebels". He conveyed "our government's satisfaction with the recent UN Security Council vote" on UNAMIR, which he hoped would help "ensure implementation of the Accords." In reply to Habyarimana's request for U.S. economic assistance, Christopher said "we want to continue helping Rwanda" but noted "the financial constraints" the U.S. faced. Document 27 State 313040, 14 Oct 93 Neither official addressed Habyarimana's stated reservations about the Accords nor that a transition deadline had passed unmet. The next month extremists began calculated attacks to challenge the newly-arrived UN peacekeeping force and undermine the transition agreement. While Director of Central Intelligence (DCI) James Woolsey did not have a close working relationship with President Clinton (Note 17), as a statutory advisor to the National Security Council and a member of the Principals Committee he provided intelligence assessments and judgments for top decision-makers, as did Deputy DCI Adm. William Studeman. CIA officials briefed Clinton and National Security Advisor Lake every morning, responded to taskings by Lake and others, and provided briefings and assessments daily for inter-agency meetings on the Rwanda crisis. CIA's analysis, chiefly produced by its Directorate of Intelligence, may include reporting from its 'stations' overseas, or reports by its officers from visits to countries where no station exists; reports from overseas human 'assets' recruited by CIA officers; reporting from its 'intelligence liaison' relationships with allied intelligence services, in the Rwanda case, those of France and Belgium; reporting from other U.S. government Departments and agencies; and monitoring of radio broadcasts through the Foreign Broadcast Information Service. Any or all of these sources are used in CIA's foremost intelligence products relied upon by policymakers during the Rwanda crisis: the President's Daily Brief and the National Intelligence Daily. CIA's President's Daily Brief (PDB) is, as the title suggests, intended for the President, although during the Clinton Administration it was read regularly by National Security Advisor Lake, Secretary Christopher, Secretary Perry, and Chairman of the Joint Chiefs of Staff John Shalikashvili. (Note 18) As the PDB contains information and often the identity of the information's source, it is "the most restricted and sensitive current intelligence publication." (Note 19) While CIA has previously released PDBs on issues such as the Six Day War and the Vietnam War (Note 20), the CIA refuses to release PDBs from the Rwanda crisis whether or not the information was "accepted, rejected, or otherwise incorporated by senior leadership." Document 32 CIA letter, 14 Aug 01 However, given that the topics in the PDB correspond considerably with the National Intelligence Daily (Note 21), it is very likely that Rwanda was a regular item in President Clinton's daily intelligence briefing. I would like to thank the Archive's Tom Blanton, Bill Burr, and Jeff Richelson for their comments on drafts of this report. 1. Alison Des Forges, Leave None to Tell the Story: Genocide in Rwanda (New York: Human Rights Watch/FIDH, 1999), pp. 96-97. 3. "Interview With the French Media in Paris, June 7, 1994", Public Papers of the Presidents of the United States, William J. Clinton III 1994, Book I-January 1 to July 31, 1994 (Washington DC: United States Government Printing Office, 1995), pp. 1056-1057. 5. Samantha Power, "Bystanders to Genocide: Why the United States Let the Rwandan Tragedy Happen", The Atlantic Monthly, September 2001, p. 104. 6. John Shattuck, Freedom on Fire: Human Rights Wars & America's Response (Cambridge: Harvard University Press, 2003), p. 45. 7. Federal News Service, "Hearing of the Commerce, Justice and State Subcommittee of the Senate Appropriations Committee, Subject: Fiscal Year 1995 International Affairs Budget, Chaired by: Senator Ernest "Fritz" Hollings (D-SC), Witness: Warren Christopher, Secretary of State, 253 Russell Senate Office Building, Washington DC, April 21, 1994"
9. Private interview with intelligence official, October 7, 2002. 10. Walter Pincus, "PDB, the Only News Not Fit for Anyone Else to Read", The Washington Post, August 27, 1994, p. A7. 12. "The Crisis in Rwanda", Hearing Before the Subcommittee on Africa of the Committee on Foreign Affairs, House of Representatives, 103rd Congress, 2nd Session, May 4, 1994 (Washington DC: U.S. Government Printing Office, 1995). 14. See "Take Care of My Children", The Washington Post, April 8, 1994, p. A21; Alison Des Forges, "The Method in Rwanda's Madness; Politics, Not Tribalism, Is the Root of the Bloodletting", The Washington Post, April 17, 1994, p. C2; and Alison Des Forges, "A Life Saved", The Washington Post, April 19, 1994, A15. 15. The 'Intelligence Community' is coordinated by the Director of Central Intelligence. Its members are the intelligence components of 15 Federal Departments and agencies. See http://www.intelligence.gov/1-members.shtml. 16. Private interviews with senior Administration official, January 16, 2002 and January 28, 2004; senior intelligence official, March 28, 2003; senior intelligence official, January 17, 2003; intelligence official, October 7, 2002. 17. Nina J. Easton, "The Hawk: James Woolsey Wants Iraq's Saddam Hussein Brought to Justice", The Washington Post, December 27, 2001, p. C1. 18. Pincus, "PDB", p. A7. 19. Jeffrey T. Richelson, The U.S. Intelligence Community, 4th ed., (Boulder: Westview Press, 1999), p. 316. 21. 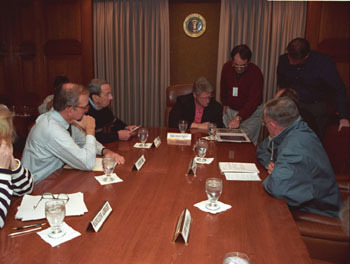 Private interview with senior Administration official, January 28, 2004. 22. Richelson, p. 317. The NID has been succeeded by the Senior Executive Intelligence Brief. 23. Private interview with senior intelligence official, March 28, 2003. 24. Private interview with senior Administration official, January 28, 2004. 25. NIMA has been succeeded by the National Geospatial-Intelligence Agency. 26. General Wesley K. Clark, U.S. Army (Retired), Waging Modern War: Bosnia, Kosovo, and the Future of Combat (New York: Public Affairs, 2001), pp. 30-31. 27. The White House, "PDD 2: Organization of the National Security Council", January 20, 1993, Presidential Directives on National Security From Truman to Clinton, ed. Jeffrey T. Richelson, (Alexandria, VA: Chadwyck-Healey, Inc, 1994), no. 02130, p. 1. 30. Private interview with senior Administration official, January 28, 2004; private interview with senior White House official, March 10, 2004. 31. "PDD 2: Organization of the National Security Council", pp. 2-3. 34. See the discussion of media coverage in Samantha Power, "A Problem From Hell": America and the Age of Genocide (New York: Basic Books, 2002), pp. 355-357. 35. LGen. Romeo J. Dallaire, Shake Hands With the Devil: the Failure of Humanity in Rwanda (Toronto: Random House Canada, 2003), pp. 332-333. Quote taken from Power, "A Problem from Hell", p. 355.